You're never the same person after you travel. Now that I've been back in the States for a few weeks, I've been able to view my normal life in my home country through my new set of eyes. Doing so has helped solidify my reflections about my trip experience. I've been asked a couple dozen times: "So, what did you think of Turkey?" I had been hemming and hawing at my response. But, ladies and gentleman, I am now ready to share my answer. Part 1 is below. Parts 2 and 3 will follow in the coming days. The thing I like most about Turkey is hearing the Muslim prayer calls five times each day. The prayer calls are absolutely beautiful. Absolutely haunting. I particularly enjoy hearing the prayer calls in the wee hours of the morning, when the calls echo off the stillness of the dawn. I also enjoy hearing the prayer calls in the middle of thunderstorms. The calls add a level of eerie intensity to the thunder, the lightning, and the rain. To hear a prayer call, jack up your volume, click the play button below, and then close your eyes. Be prepared to be taken to another place. I really like the blue eye amulets, which seem to be more prevalent than air molecules in Turkey. Turkish people believe that an evil eye, if fixed upon you when you are unaware, will cast an evil curse. To ward against these curses, amulets (called "nazar boncuğu") are placed in houses, in automobiles, and most everywhere else. In regions of the world where light-colored eyes are uncommon (such as in Turkey), people with blue (or green) eyes are thought to bestow a curse. As such, the evil eye talismans in Turkey take the form of blue eyes. Gulp! As an owner of blue eyes, I guess this explains why I often received an unwelcoming glare when I smiled at a passerby's adorable children! 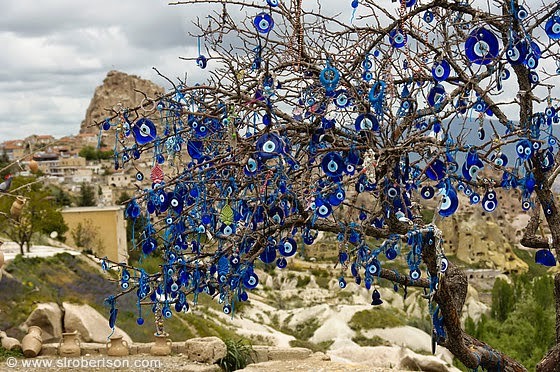 A tree of evil eye amulets, in Cappadocia. I like that the Turkish language is phonetic. Once you learn the sounds of the characters, once you master the few sounds that we don't have in English (such as ğ, ı, ö, ü), and once you remember that a "c" is pronounced like a "j," then you're golden! Though you may not understand what you're reading, at least you can speak the language. It took me awhile to get comfortable with the "ı" (the "i without the dot") sound. To me, it's not a comfortable sound to make. It's the sound of retching. I suppose we all struggle with sounds that are not native to our tongues. Native Turkish speakers, for example, have a hard time with the "th," "v," and "w" sounds in English. Whenever Ferit says "thirty," it sounds like "dirty." And I can never tell the difference between when he says "law," "loaf," and "love." 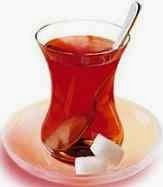 I love my tea, and so do Turkish people. They drink it all day long. Heck, they'll even pull over on the side of the road to enjoy a cup of çay (pronounced "ch-eye"). They also like to put gobs of sugar in their tea, which ain't exactly my "cup of tea," but that's a-okay. Turkish tea, served in a typical tulip-shaped glass. Turkish tea is brewed differently than it is in the United States. Turks make their tea in a double-tiered teapot. 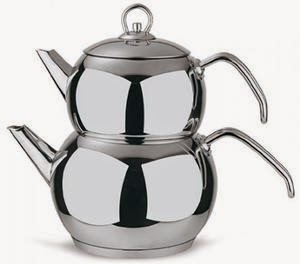 A very strong pot of tea is brewed in the upper teapot, while pure water is heated in the lower teapot. Once the tea is brewed, the super-duper strong tea from the top pot is poured into the tea cup, typically to the "waist" height of the tulip-shaped glass, and then the rest of the glass is topped off with hot water from the bottom pot. There are ruins everywhere in Turkey. In the United States, we're lucky if our historical "ruins" are 100 years old. And it's quite amazing if we chance upon anything that is 200 years old. But in Turkey, the ruins are multiple hundreds of years old and sometimes even thousands of years old. It's quite impressive. which was completed in 135 AD. It's expensive to eat healthily in the United States -- but not so in Turkey. Vegetables and fruits are insanely inexpensive in Turkey, especially if they are purchased at the outdoor markets. There are lots of homeless kitties and doggies roaming the streets of Turkey. Most all of the feral cats and dogs have remarkably clean teeth and gums. The food foraged from dumpsters and streets apparently is more dental-healthy than the food we feed our pets in the United States. Although my only hamam (or Turkish bath) experience was a private in-hotel-room hamam, it was a wonderful bathing experiences. I certainly appreciate showers, but a Turkish bath every now and then is heavenly. Mom and me, enjoying our private hamam. Unlike in the United States, solar-powered water heaters are reasonably priced in Turkey. As such, nearly every home uses the energy of the sun to heat its water. Sure, showers may need to be rescheduled or sometimes forgone on cloudy days, but that's a justifiable trade-off for saving energy. Two thumbs up for Turkey! In traditional homes, meals are enjoyed on the floor, sitting around a slightly raised large round tray, with a large cloth spread under the tray and over laps to collect crumbs. I love sitting on the floor to eat -- it's a far more down-to-earth way of enjoying a meal (no pun intended). Ferit's anneanne and I, about to have lunch. I am surprised how quickly Turkish people eat. Since returning from Turkey, I've learned that in rural areas, in particular, it's common to eat quickly. One reason is because there is always work to do in the fields, hence little time for eating. Another reason is because everyone eats from communal plates, hence there is no food left for slow eaters. Apparently, you can tell how successful a person will be by how quickly he or she eats. Ferit can down a meal in two seconds flat; he'll go far in life. Below are some random observations about Turkey that were not mentioned in prior blog posts. There are tons of street kitties. I so much wanted to give love to each and every kitty I saw. But the sight of the fleas (which are visible on many of the cats), along with the knowledge that feral cats spend their days dumpster diving, dwindled my desire to hug and pet the kitties. Cell phone storefronts in Turkey are as prevalent as Starbucks coffee shops in the United States. Because most people use pre-paid phone plans in Turkey, there is a lot more interaction with cell phone companies. Turks love Mustafa Kemal Atatürk. (Atatürk was the founder of the modern day Republic of Turkey.) And they show their love for Atatürk in all ways, shapes, and forms. Flags. Posters. Stickers. Ties. Tea cups. Tattoos. You name it! Related to the above bullet point, while Atatürk did a great job modernizing the country when he created the Republic of Turkey, I can only identify one point on which he failed. In my opinion, Atatürk should have mandated larger teacups; the current tulip-shaped tea cups are just way too small. Related to the above two bullet points, it's interesting how, under the recent government, a lot of the modernization that Atatürk introduced back in the 1920s has been replaced by more traditional and old-fashioned ways. Sadly, Turkey was more progressive in the past. I don't know how many times I heard the phrase "This is Turkey -- anything is possible." I'd like to say that this phrase always implies good anythings, such as the potential appearance of flying unicorns. But, unfortunately, this isn't the case; "anything is possible" can imply not-so-good things as well. Stay tuned for Part 2: What I Like About the United States. One correction... We do have long term cell phone plans. It's just that most people prefer prepaid plans. People who can not afford to pay the bill for a phone, they still get it. Because, they can still receive calls for free. They just can't make calls. We have an amulet on the house brought back by Michelle! Haven't been evil eyed, except when deserved from her, in years! Love the recap, you have a knack lady of summing things up, yet filling them with the emotions that come with it. I am afraid I would get in trouble with my big travel mug, little tea cups just dont work for me, but I am all over the eating on the floor and quickly. HATE fleas but love kittens, so that would be hard! and The ruins were my favorite part of the trip. My biggest shock when I was in England was a grave stone that said 985 AD. And you are very correct. Anything means ANYTHING. Can be scary. Welcome home lady, and thanks for bringing me along! I had never heard of the blue evil eye amulets! It must have felt strange walking around with your own blue eyes! I admire you, you really tried a lot of new things and learned so much about the Turkish culture.